Whenever you cross paths with an Equisetum, you are looking at a member of the sole surviving genus of a once great lineage. The horsetails, as they are commonly called, hit their peak during the Devonian Era, some 350 + million years ago. Back then, they comprised a considerable portion of those early forests. Much of the world's coal deposits are derived from these plants. The horsetails once towered over the landscape, reaching heights of 30 meters or more. Today, however, they have been reduced to mostly small, lanky plants. 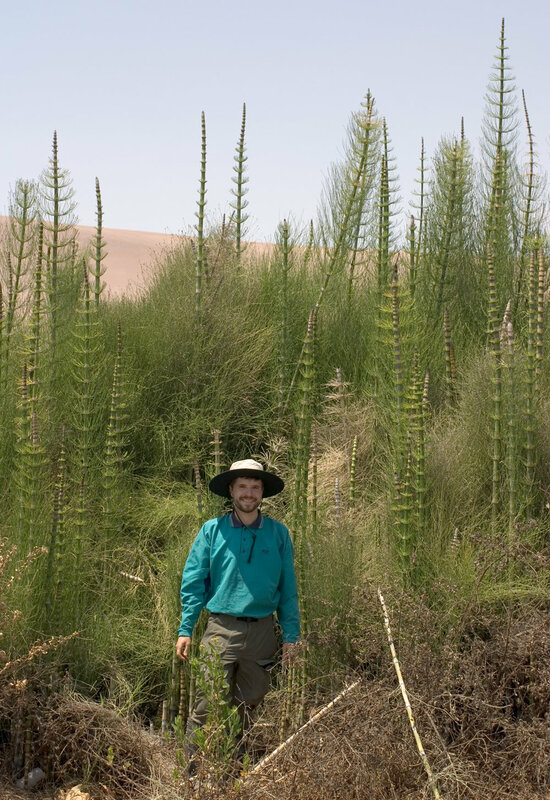 The tallest of the extant horestails are the giant horsetail (Equisetum giganteum) and the Mexican giant horsetail (Equisetum myriochaetum) of Central and South America. These two species are known to reach heights of 16 ft. (4 m.) and 24 ft. (7 m.) respectively. Certainly an impressive site to see. As a genus, Equisetum is composed of somewhere around 20 species, with many instances of hybridization known to occur. Most species tend to frequent wet areas, though dry, nutrient poor soils seem to suit some species just fine. The horsetails are known for their biomineralisation of silica, earning some the common name of "scouring rush." Settlers used to use these plants to clean their pots and pans. However, this is certainly not why this trait evolved. It is likely that the silicates have something to do with structural support as well as physical protection against pathogens. More work needs to be done looking at the benefits rather than the mechanisms involved. Though they are not ferns, horsetails are frequently referred to as "fern allies." This is due to the fact that, like ferns, horsetails are not seed plants. Instead, they produce spores and exhibit a distinct alternation of generations between the small, gamete-producing gametophyte and the tall spore-producing sporophyte. Spores are produced from a cone-like structure at the top of the stem called a stobilus. This may be attached to the photosynthetic stem or it can arise as its own non-photosynthetic stem. Either way it is an interesting structure to encounter and well worth studying under some form of magnification. Despite their diminutive appearance, many horsetails are quite hardy and thrive in human disturbance. For this reason, horsetails such as E. hyemale and E. arvense have come to be considered aggressive invasive species in many areas. They thrive in nutrient poor soils and their deep, wide-ranging rhizomes can make control difficult to impossible. There is something to be said for these little plants. Love them or hate them, they have stood the test of time. They were some of the first plants on land and it is likely that some will be here to stay, even if we go the way of the Devonian forests.